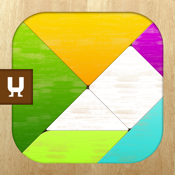 Tangram puzzle is a great educational tool for your child. This game will fascinate young players and help them improve dexterity, color recognition, memory, imagination and creativity, all while having fun. The game has a number of templates with pictures, based on a grid, and a bank of figures which are used to complete the tangram picture. Select, rate and play cards from the Public Gallery - endless source of community-generated content! * An easy-to-use Help key which shows the correct outline on the tangram picture (this game is so intuitive that it doesn't need any other help functions or instructions). * Easy posting to Facebook account, and the ability to send a posting of the results by an email account. * The game claps and cheers the player when they complete a card correctly, giving them positive feedback. PopAppFactory – an independent game developer of digital educational apps for kids from 2 to 12 years old. We make innovative and aesthetically perfect digital toys for kids that shift mobile experience from entertainment to education.